In a 54-46 vote, Scott Pruitt has been confirmed by the U.S. Senate as administrator of the U.S. EPA. President Donald J. Trump nominated Pruitt—arguably the most controversial of Trump’s cabinet nominees—as EPA administrator in early December. Neste Corp. is evaluating investment in new production capacity in Singapore and the U.S. The news comes after its most profitable year yet in renewables and speculation on how the new U.S. administration will view subsidized imported product. In continuation of the ongoing legal dispute over volumes set by the U.S. EPA under the RFS vs. statutory volumes required by Congress, the NBB filed a petition Feb. 10 asking the court to review EPA's final volume standards set for 2017-'18. Particle counters are simple to operate and provide immediate results. They measure and count particles, presenting the results in size bands, giving a snapshot of the particle distribution in terms of particles/ml and ISO 4406 cleanliness codes. The handheld DieselProve technology from Salunda Ltd. is designed to provide a fast and simple diagnostic tool to assess the biodiesel content in diesel fuel blends as well as identify impurities, such as vegetable oil, white spirit and water. D3MAX has announced the completion and shipment of its pilot plant employing the patented D3MAX cellulosic ethanol technology. The pilot facility will be installed at Ace Ethanol LLC in Stanley, Wisconsin, in late February. The National Biodiesel Board named Doug Whitehead as its chief operating officer Feb. 7. Whitehead joins the executive team after 10 years in various roles with the organization, most recently as the director of operations and membership. The Texas A&M oil mill operators short course will be held April 2-4 in College Station, Texas. 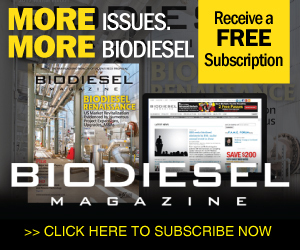 Topics of interest to the biodiesel sector include maximizing oil recovery, new process technologies and greenhouse gas legislation. Registration is $150. During Phase 4 of the multiyear trial with Michigan State University, the research of sequestering CO2 for algae growth has shown that PHYCO2's algae photobioreactor can be utilized to treat wastewater through algae growth and cultivation.